To clarify that, there are facts realized by the mind, and feelings that overwhelm the heart; these feelings which overwhelm the heart are the sweetness of faith. What makes the believer sacrifice everything for the sake of religion is the sweetness of faith, just like when someone has the blue prints ofof a magnificent palace that has huge rooms and big lobbies, this palace is but blue prints that were prepared by engineers, but the one who owns the drawings doesn’t even own a cottage to live in; The sweetness of faith is to own that palace and to live in it. There is a big difference between one who owns the palace and he who owns only the drawings, and what attracts the attention is that the noble companions of the prophet achieved victory in a short period of time and they made miracles and they moved from grazing sheep to leading nations. Although you see the Islamic appearances are very obvious nowadays but still the milliard and the three hundred million Muslims have no importance (or weight) although they are the third of the inhabitants of the world. In fact, the sweetness of faith is the feeling that makes the man as a hero or legend, and what the noble companions achieved is unbelievable;, our master Al sedeek received from our master Khalid (may Allah be pleased with them both) a request of reinforcements in one of the battles in which Muslims were thirty thousand and the infidels were three hundred thousand, he asked for reinforcement. Is it reasonable to send only one person when he asked for fifty thousand?, Al sedeek sent him Al kaka ax bn amr, when he arrived, our master Khalid asked him, where is the reinforcement? he said ; me, I am the reinforcement., He was surprised, then he read the letter which was sent with Al kaka abn amr; our master Al sedeek said in the letter ; by Allah Khalid, and by Who sent the holy Quran down on the heart of Mohammad an army which has al kaka among the soldiers is an undefeatable army, one equals thousand, one as a thousand, everyone of the companions of the prophet equals thousand, and a thousand of a corrupted nation doesn't equal even a sigh,. You may travel to a far country to study, you find if you buy a house and you pay its price by usurious installments, the price of this house is a debt, you pay its installments and because you have a debt you don't pay taxes and when you own it you feel comfortable and all of your interests are through this usurious debt. All the troubles and the burdens come from renting a house and all comfort and facilities come from the usurious installments, that is the wisdom of Allah. What Allah has prohibited is very easy and what he has ordained is very difficult, and if it is vice versa, people would turn to what Allah has ordained not for the sake of His love or His obedience or to gain His paradise but because it is easier, but the wisdom of Allah has willed that What Allah has prohibited is very easy and what He has ordained is very difficult, He who rents the house is threatened to be out of the house any time and he should pay lots of taxes and he owns no house there; this person pays the price of the sweetness of faith, if he says I am the happiest person ever you should believe him because he pays the price of the sweetness of faith. Man, according to his nature loves the rich and the powerful, the powerful people support him and the rich people shower him with their money but if he has a poor relative who is a forgotten righteous believer, therefore when the believer builds his relations on the base of faith he sticks to the believers even if they are weak and poor and renounces the disbelievers and the infidels even if they are rich and powerful he pays the second condition of the sweetness of faith. The sweetness of faith is astonishing, dear brothers, the sweetness of faith makes you a hero, the sweetness of faith makes the gold equals to dust in your eyes the sweetness of faith gives the life a meaning. The second condition; to build your relations on loyalty and honesty, to be friend to a weak poor believer, you love him, visit him and welcome him, and you abstain from having relations with the corrupted people, you love believers even if they make mistakes and you may get some harm from them but you stay with them; the honest believer stays with the believers and abstains from the infidels even if they are able to profit him. That is why I say: to respond to the invitation of the rich people is from the worldly life but to respond to the needs of the poor are from the deeds of the hereafter. Someone may invite you from the suburbs of the city there are difficulties in the transportation and the food is modest so you may apologize in a nice way and refuse the invitation; on the other hand and you may receive an invitation from a rich person with plenty of food and facilities in transportation you will accept the invitation without hesitation, you don’t realize that you follow your interests. 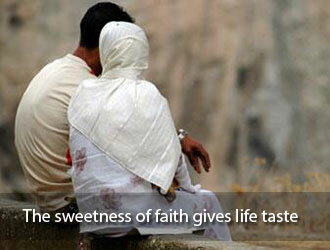 Therefore the loyalty and honesty are high prices of the sweetness of faith. From the signs of the weakness of faith, dear brothers, is the one who worships Allah as it were, upon the very edge (i.e. in doubt); if good befalls him, he is content therewith; but if a trial befalls him, he turns back on his face (i.e. reverts back to disbelief after embracing Islam). He loses both this world and the Hereafter. (Say (O Muhammad ): "Verily, my Salat (prayer), my sacrifice, my living, and my dying are for Allah, the Lord of the 'Alamin (mankind, jinns and all that exists). (Men whom neither trade nor sale diverts them from the Remembrance of Allah (with heart and tongue), nor from performing As-Salat (Iqamat-as-Salat), nor from giving the Zakat. They fear a Day when hearts and eyes will be overturned (from the horror of the torment of the Day of Resurrection). These are the prices of the sweetness of faith, believe me, dear brothers, between the facts of faith and the sweetness of faith, it seems like the difference between the one who utters by his tongue a million dollars and one who owns it. There is a big difference, if you own it you live in a magnificent house with an expensive car and you may buy an airplane and yacht. The Islamic world speaks about the facts of faith but because they don't pay its price they don't taste the sweetness of faith , they seek weak legal opinions , in every difficult case they say ; this is from the general affliction , bribe becomes from the general affliction , mixed meetings and all the sins are covered with the term "general affliction " therefore there is a veil between them and Allah , that is the bitter truth. If the whole worldly life from its beginning to its end was give to a man , then death comes to him he is like the man who had pleasant dreams then when he woke up he found nothing. Naayem said ; if we compare the whole worldly life to the hereafter it would be less than a whit, the worldly life took from the hereafter what the needle took from the water of the sea when it was dipped in it. Dear brothers, when you taste the sweetness of faith you become a different person , if all the measures didn't get reversed then you didn't taste the sweetness of faith , what does it mean by all the measures get reversed ? man considers himself smart if he collects money , whereas the believer who tastes the sweetness of faith considers himself smart when he spends the money, he buids his life on giving , the first one builds his life on taking , if your measures didn't reverse then you didn't taste the sweetness of faith , you become happy when you give not when you take , the sweetness of faith needs a strong will and deep awareness and persistence , and when you pay the price of the sweetness of faith, Allah astonishes you by His giving. The last idea, you don't get attracted to religion because it gives you an explanation about universe , life and human or because of the religious thinking but because of the sweetness of faith , you live a life that you never imagine, but you should pay the price. Man went to the biggest shop that sells carpets and he said; I want a first-class carpet, the salesman showed him a carpet worth eight hundred thousand pounds, yet he offered to pay five Syrian pounds, could this man get out of the shop safe? Some people want to achieve paradise by two raka (prostration ) without ablution , and by spending two pounds to the poor , that is the situation of Muslims , and one of the sins is to ask for paradise without paying its price , verily the goods of Allah are expensive.